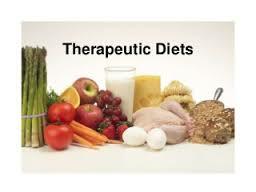 A therapeutic diet is a planned menu that restricts the intake of certain types of foods, which is normally prescribed by a physician and designed by a licensed dietitian. Assisted living homes will also provide therapeutic services to seniors when ordered by a licensed seniors physician. A therapeutic diet is usually modified from the seniors existing diet and is tailored fit to meet all the nutrients that are needed in a balanced diet. Therapeutic diets are can be modified for many different reasons, such as nutrients, texture, and food allergies or food intolerance. Includes the smallest amount of fluids. There are many examples such as Juices without pulp, broth soup, and different kinds of Jell-O’s. Usually is the first step to restarting oral feeding after surgical procedures. Can also be used for fluid and the replacement of electrolyte in individuals with diarrhea problems. Should not be used for an extensive period of time and it does not supply the proper amount of calories and nutrients. Includes ice cream, flavored puddings, hot cereals, custard, strained creamy soups, and different juices with pulp. Usually is the second step to restarting oral feeding once clear liquids are tolerated. Used for seniors who cannot endure a mechanical soft diet. Should not be used for extended periods of times. Is considered a loose diet for diabetics when their weight and blood sugar levels are under control. It includes normal foods without the adding of any additional sugar. Calories are not counted as in ADA calorie restricted diets. These diets restricted calories, carbohydrates, protein, and fat intake in balanced amounts to meet dietary needs, control blood sugar levels, and control weight. The Most frequently used calorie levels are: 1,200, 1,500, 1,800 and 2,000. Is a frequently used diet with no salt shakers on the tables. Food is lightly seasoned as standard food. Can also be named a 2 gram Sodium Diet. restricts salt and salty foods such as bacon, sausage, cured meats, canned soups, salty seasonings, pickled foods and saltine crackers, just to name a few. Is used for people who may be “retaining water” or who have high blood pressure, heart disease, liver disease, or beginning stages of kidney disease. Is frequently used to decrease fat levels and treat health conditions that Interfere with how the body uses fat such as diseases of the liver, gallbladder, or and pancreas. Is used to restrict fat to 50 grams or no more than 30% calories resulting from fat. Is lower in total fat and saturated fats and contains just about 250-300 mg cholesterol. Is usually prescribed for the prevention of gastrointestinal, cardiovascular, and metabolic diseases. Increased fiber can from many different sources including fruits, vegetables, whole bread and cereals. The diet plan is personalize depending on if the senior is on dialysis. It restricts sodium, potassium, fluid, and protein specified levels. The Lab work is followed closely. Are usually used when there are issues with chewing and swallowing. Changes the consistency of the regular diet to a softer texture. Includes sliced or ground meats as well as sliced or ground raw fruits and vegetables. Are usually used for seniors with poor dental conditions, missing teeth, no teeth, or a condition known as dysphasia. Changes the usual diet by pureeing it to a soft liquid constancy. Are for those with wired jaws extremely poor dentition in which chewing is inadequate. Often thinned down so it can pass through a straw. Avoid all types of nuts, seeds, raw vegetables, and raw fruits. Is nutritionally sufficient when offering all food groups. Foods continuing allergies are solely eliminated from the diet. Suitable replacements are made to ensure that the meal is adequate. The most general food allergens are milk, egg, soy, wheat, peanuts, tree nuts, fish, and shellfish. Most gluten free diets eliminate all kinds wheat, rye, and barley and it is replaced with potato, corn, and rice products. Other types of food intolerances include poor reactions to certain products added to food to improve taste, color, or protect against bacterial growth. Some of the most frequent symptoms involving food intolerances are vomiting, diarrhea, abdominal pain, and headaches.